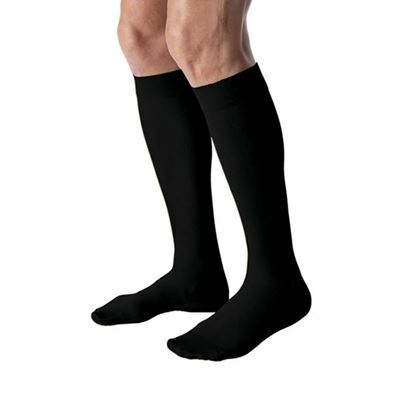 Designed for men's needs, the JOBST for Men range of Knee Length socks are the ultimate in fashionable, comfortable, gradient compression hosiery. 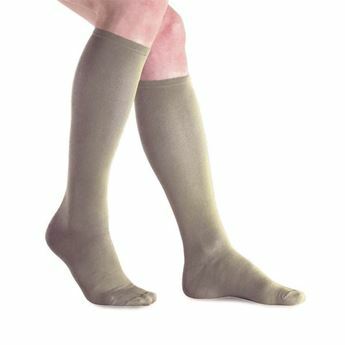 Easy to wear: attractive ribbed design with 3D knit structure; comfortable band keeps the socks up without binding; flat toe seams and a roomy toe section offer wearer comfort; anti-bacterial additive reduces unpleasant sock odour; 20-30mmHg and 30-40mmHg socks have Special Moisture- Transport System with soft micro and multi-fibre yarns in the sole keeps feet dryer. Reinforced heels for a longer lasting, durable product. NOTE. A doctor's prescription must accompany orders for garments with 30-40mmHg compression. Due to health regulations, we cannot accept Garment exchanges. As of September 2016, the only colour available is Black.